From Sorong I headed to Pulau Birie, home of Papua Paradise. One of the first things I noticed after arriving was a sign saying "Welcome to Paradise" and I spent indeed a couple of unforgettable days there. Right after checking in and inspecting my beautiful bungalow built on stilts in the ocean, I noticed the sea grass in front of my balcony. I was informed that the day before a Dugong was sighted by my neighbors. So I decided to keep a lookout, since Dugongs are still on my list of things to see :). 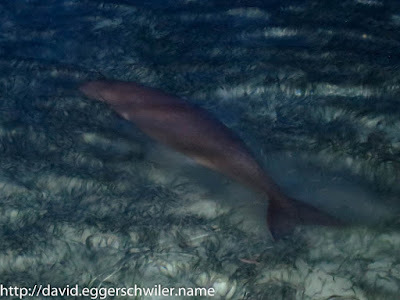 And indeed, shortly after sundown, my neighbors spotted the Dugong again as it was slowly making its way across the sea grass, right in my direction. Since the sun had now finally set, I fetched a torch and managed to observe it for a couple of minutes and snap a couple of pictures :). 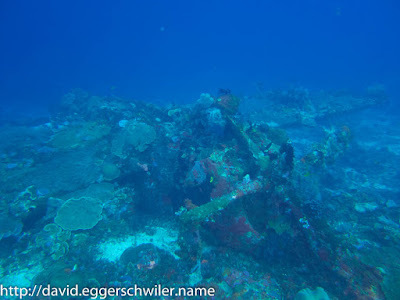 The next day I went diving. 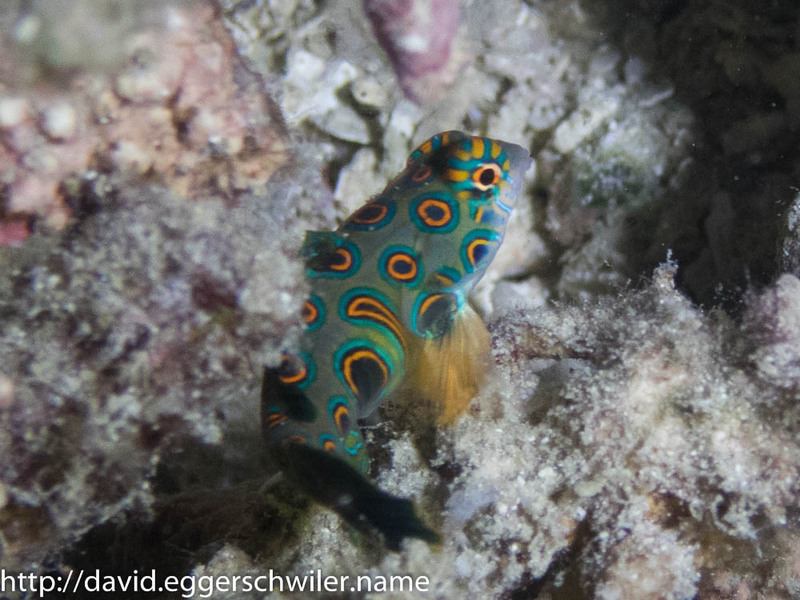 After two nice dives on nice reefs with a large amount of fish live, I headed out again for a Mandarin-/Sunset-Dive. The first thing that crossed my path was a juvenile Barramundi, and for once it wasn't shy! 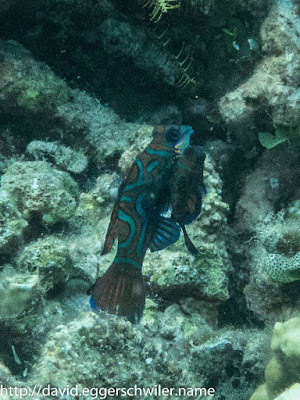 The Mandarinfish were also present, but rather shy if lights were used. 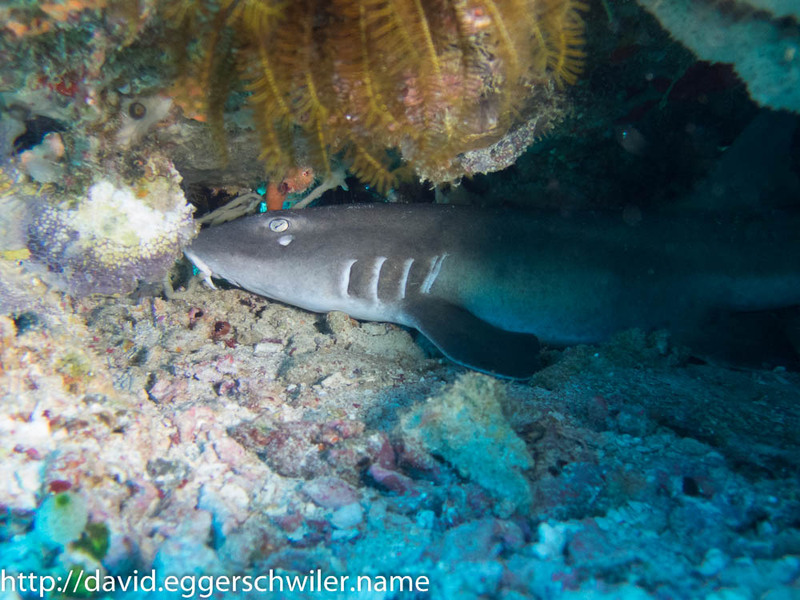 After seeing some dashing around the rocks, I noticed a couple that slowly mounted upwards together before swimming back down again. They repeated this several times. 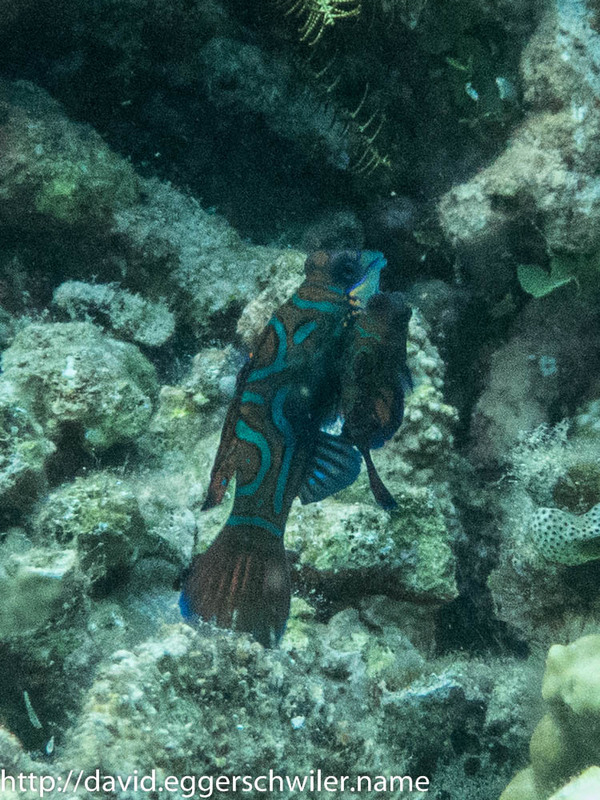 And so I was able to observe the mating dance of the Mandarinfish on my second Mandarin-Dive! The next highlight of this dive were the Picturesque Dragonets, that looked a bit like the Mandarinfish and were found very close by. One of them was eaten by a Scorpionfish while I was watching! (Poor Dragonet!) I was so baffled, that I didn't record the event. 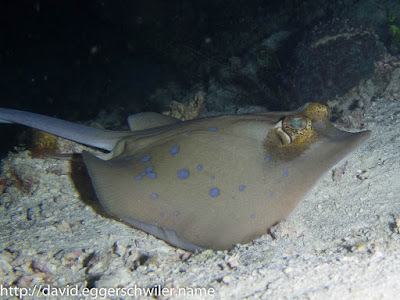 After mostly seeing Bluespotted Ribbontail Rays during this dive trip, I encountered my first Bluespotted Stingray in quite a while. The next morning held another adventure. We dove down to 30 meters to inspect the wreck of a P-47 D Thunderbolt "Razorback". This fighter plane crashed on 21st October 1944 because it ran out of fuel. The plane is structurally still intact, even if it lays on its head, and it is possible to look into the cockpit and see the guns on the wings. On the second dive I inspected a crevice under a large bommy and was very surprised to see a Brown Banded Bamboo Shark. In the afternoon I used the opportunity to explore the island. 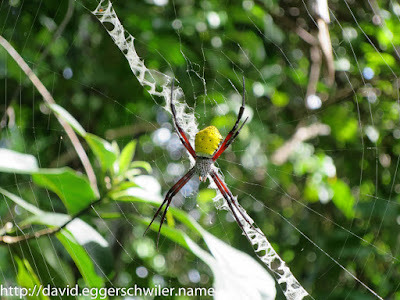 Even though I didn't spot many birds, which there normally are but I chose the wrong time of day, I encountered spiders, crickets, butterflies and lizards. Even though I only stayed three days, I had a terrific time and was incredibly lucky to see so many interesting things :). 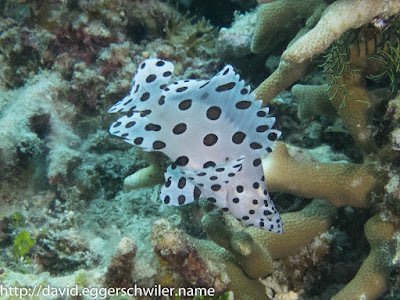 Should I return to Raja Ampat then Papua Paradise will definitely be on the short list. Oh wie schön...ich will auch!! !